Sunday, September 14th: Signs Of The Changing Seasons, In Spite Of The Thermometer! Suncrest peaches from Booth Canyon Orchard at Ballard Farmers Market. Copyright Zachary D. Lyons. We have TONS of Italian prunes this year. We will have them at Ballard Farmers Market for at least the next 3-4 weeks. Also this week, very special Crandall BLACK CURRANTS. Not sure what one does with them, but European baker types rave about them. This week also: Sweet 16 apples, Orcas pears (this week only), and more Suncrest peaches (pictured above… last week for those). Black turtle shelling beans from Growing Things Farm at Ballard Farmers Market. Copyright Zachary D. Lyons. Growing Things Farm’s lovely displays of green beans have given way to displays of shelling beans now. See, that’s what many of those green beans do. They mature into these shelling beans. It’s like “green onions” and “green garlic.” It’s the immature fruit of the plant. And these black turtle shelling beans are the mature fruit. If you like black beans, these are them, fresh from the field. Pop open the pod, and those beans are black as night! And they will taste better than any dried beans you’ve ever had, too. Italian prunes from ACMA Mission Orchards at Ballard Farmers Market. Copyright Zachary D. Lyons. Speaking of Italian prunes, ACMA Mission Orchards has them right now, too. But aren’t these really plums, you ask? Aren’t all prunes dried plums? Actually, all plums are members of the family Prunus. These are proper prunes, with a more oval shape, to a plum’s round shape. And all prunes are freestones, meaning they come easily off of their pit for easy eating, drying and cooking. Think of the sauces, chutney and jams! This is an extraordinary year for these prunes, like so many other crops, so enjoy it while you can. Celery from One Leaf Farm at Ballard Farmers Market. Copyright Zachary D. Lyons. It’s getting deep into celery season folks. Nothing like some crisp celery on a crisp night. Besides, you are cooking more now, and your heartier fall recipes call for lots of this super food. Lucky for you, One Leaf Farm has some gorgeous celery right now, grown just a few miles from here in Carnation! Gene Panida of Wilson Fish holding a whole wild Washington king salmon at Ballard Farmers Market. Copyright Zachary D. Lyons. The Washington coastal king salmon fishing season closes on September 15th — that’s Tuesday. And it means that you have just this Sunday and next to get some of this amazing fresh, local king salmon from our friends at Wilson Fish. And don’t forget their amazing smoked king salmon, too! Belgian-style ales from Propolis Brewing at Ballard Farmers Market. Copyright Zachary D. Lyons. And it’s last call for Corona Farms Borage ~ a borage flower ale with delicate cucumber, floral, marmalade champagne notes. Coriander from Oxbow Farm at Ballard Farmers Market. Copyright Zachary D. Lyons. Here is something we don’t see very often at your Ballard Farmers Market: coriander! But given this summer’s heat, many a farmer’s cilantro crop bolted. And a few patient farmers just let it go to seed. And what is the seed of cilantro called? That’s right, it’s called coriander. If you are in the market for the freshest coriander you will ever encounter, stop by Oxbow Farm today and grab a bunch. Oh, and they’ll have some righteous strawberries today, too, as well as some lovely table grapes. Concorde pears from Tiny’s Organic at Ballard Farmers Market. Copyright Zachary D. Lyons. Big, beautiful and delicious Concorde pears from Tiny’s Organic are in at your Ballard Farmers Market. These giants of the pear world are the quintessential pear, a cross between the great ancient Conference and Comice varieties, developed in England years ago. They enjoy a superior flavor, texture and a dramatic, classical pear shape. They are only around for a month or two each fall, so enjoy them while you can! Winter squash from Boistfort Valley Farm at Ballard Farmers Market. Copyright Zachary D. Lyons. Holy season changes, Batman! Winter squash is in the house at your Ballard Farmers Market! Yup. Several farmers today will have the sweet, delicious gourds favored for the cold, dark, wet months. With our nights longer and cooler, it is time to crank up the oven and roast you some squashy deliciousness, filling your whole home with its aroma before you devour it mercilessly. These particular beauties come from Boistfort Valley Farm. Sweet corn from Alm Hill Gardens at Ballard Farmers Market. Copyright Zachary D. Lyons. More Westside sweet corn has arrived at your Ballard Farmers Market. You’ll find these big, beautiful, sweet ears of corn from Alm Hill Gardens in Everson. Here is a tip for chosing corn:instead of pulling open the top to see if it is filled out, simply run your thumb over the outside of the husk. You can easily feel the mature kernels inside. See, when you actually tear the corn open, you are actually ruining it either for yourself or the next person, because the minute you do that, all the delicious sugars in it that make it so sweet begin to turn to starch. So please, never tear open the husk to examine it before you buy it. If you need help choosing the best ears, just ask. Our farmers are more than happy to lend you a hand. Look who’s back today at your Ballard Farmers Market! It’s Firefly Kitchens, and their awesome selection of naturally fermented vegetables made with great local ingredients. Choose from their award-winning kimchi, their Yin-Yang carrots, or any of their krauts, from the classic kraut that is the friend of hot dogs everywhere, to the brilliant caraway kraut that pairs perfectly with any of the various bratwursts from the farmers in the Market. Rainbow carrots from Nash’s Organic Produce at Ballard Farmers Market. Copyright Zachary D. Lyons. You may recall that 2013 was a great year for many crops, but a lousy year for carrots. And the carrots for which Nash’s Organic Produce is famous took a particularly bad beating last year. So this year, to hedge their bets, Nash’s planted a lot more carrots. Of course, as Murphy’s Law would have it, 2014 turned out to be a great year for carrots. The result is, Nash’s has lots of their famous carrots now, and they are offering them at a special price today. Sweet peppers from Colinwood Farm at Ballard Farmers Market. Copyright Zachary D. Lyons. Colinwood Farm is harvesting a bunch of beautiful peppers from their greenhouses in Port Townsend this summer. They have these colorful sweet peppers as well as a great selection of hot peppers. And while it is true that Westside peppers tend not to be as hot as Eastside peppers, even the Westsiders are toasty this year. See, hot peppers get their heat enhanced by the sun. More sun and more heat means hotter peppers. Their poblano peppers are particularly good right now. Enjoy! Young reishi mushrooms from Ascended Grounds at Ballard Farmers Market. Copyright Zachary D. Lyons. This is a block of fresh, young reishi mushrooms that were ground by Cascadia Mushrooms for Ascended Grounds. Ascended Grounds then takes these wonderfully medicinal fungi and makes beverages and tinctures that are both delicious and darn good for you. I’m not sure I am versed well enough to do it justice, but they say, “Ascended Grounds transforms what it means to drink a cup of coffee. Using the ascended health practices of ancient masters, we are awakening your mug and your consciousness to upgrade your health and quality of life. Let us introduce you to the incredible synergy of medicinal mushrooms and coffee. Your ‘morning cup of joe’ will never be generic again!” Stop by today for a taste, and for the whole story, at your Ballard Farmers Market! Sunday, September 7th: Return of Booth Canyon & Camelina Gold, Westside Sweet Corn, Table Grapes, Fresh Peanuts, Nectarplums, A Guy Who Loves Making Soup & Nearing The End Of Washington’s 2014 King Salmon Season! Fresh Washington coastal red king salmon from Wilson Fish at Ballard Farmers Market. Copyright Zachary D. Lyons. Holy cow! It is September already! The kiddies are back in school, the nights are getting longer and a little cooler. And the crops in your Ballard Farmers Market are beginning to trend toward fall. And yet today, Seattle will break the 80 degree mark for the 43rd time this year. Summer is not over! If it were, after all, you wouldn’t be able to get this amazing fresh, wild Washington king salmon from our buddies at Wilson Fish. That’s because the salmon fishing season on the Washington coast ends in mid-September. So enjoy it now, while it is still here. Cuz in a couple of weeks, it won’t be! Gravenstein apples from Booth Canyon Orchard at Ballard Farmers Market. Copyright Zachary D. Lyons. Sweet corn from Stoney Plains Organic Farm at Ballard Farmers Market. Copyright Zachary D. Lyons. Westside sweet corn has finally arrived at your Ballard Farmers Market, and this year’s crop is amazing! While we’ve been enjoying the blessings of Eastern Washington’s hot weather and earlier corn crops for almost two months now, the corn fields in Western Washington have slowly been growing to maturity. You’ll find big, beautiful, sweet ears of corn from several Westside farms today, including this beautiful specimen from Stoney Plains Organic Farms in Tenino. Here is a tip for chosing corn: instead of pulling open the top to see if it is filled out, simply run your thumb over the outside of the husk. You can easily feel the mature kernels inside. See, when you actually tear the corn open, you are actually ruining it either for yourself or the next person, because the minute you do that, all the delicious sugars in it that make it so sweet begin to turn to starch. So please, never tear open the husk to examine it before you buy it. If you need help choosing the best ears, just ask. Our farmers are more than happy to lend you a hand. Eric displays huge heads of romaine lettuce from Boistfort Valley Farm at Ballard Farmers Market. Copyright Zachary D. Lyons. Over the past few years, we’ve all gotten quite familiar with our pal, Eric, working behind the tables of Boistfort Valley Farm, slinging ginormous heads of organic lettuce, or hooking us up with amazing fresh herbs or artichokes or any manner of colorful beets, turnips and radishes. But time’s come for Eric to finally hunker down and finish off a college degree he’s be slow-walking for a while now, and that makes today his last day selling for Boistfort Valley at your Ballard Farmers Market. Stop by today, wish him well, and grab some deliciousness while you’re there! Seedless Thompson table grapes from Magana Farms at Ballard Farmers Market. Copyright Zachary D. Lyons. These sweet seedless Thompson table grapes from Magana Farms make for great white raisins. Just pluck them off of the vine, give them a good rinse, and put them in your dehydrator until raisinesqueness ensues. That is, of course, as long as you don’t eat them all fresh, right off of the vine, first. On second thought. you’d better buy twice as many as you think you’ll need! Camelina oil from Ole World Oils at Ballard Farmers Market. Copyright Zachary D. Lyons. Your local cooking oil returns today to your Ballard Farmers Market, after its summer hiatus. This is camelina oil, made from the seeds of the camelina plant, an old member of the mustard family. It is grown and pressed by Ole World Oils in Ritzville, Washington. It is non-GMO, has a higher smoke point than grapeseed oil (475 degrees! ), and is high in natural vitamin E, making it shelf stable. It is also high in beneficial omega-fatty acids, with a perfect 2:1 ratio of omega-3 to omega-6. It has a great, nutty flavor that makes it a good finishing and cooking oil. It is great for cooking white fish, chicken and pork, for roasting cauliflower, broccoli, roots and potatoes, for blistering padron peppers and more. It is competitively priced, and best of all, it is local! Hilario Alvarez of Alvarez Organic Farms harvesting fresh peanuts on his Mabton farm. Copyright Zachary D. Lyons. It is fresh peanut season at your Ballard Farmers Market again! Yes, our good friends at Alvarez Organic Farms are harvesting peanuts right now from their fields in Mabton, Washington. Still don’t believe peanuts grow here? Then look at this photo I took of Don Hilario Alvarez on the farm two weeks ago! Those are two freshly-harvested peanut bushes in his hands, and behind him is acre after acre of peanuts. Peanuts are not nuts at all, but legumes, and you can see that in the pea-like leaves they have. Love boiled peanuts, or you want to roast your own? Now’s the time! Fresh cannellini shelling beans from One Leaf Farm at Ballard Farmers Market. Copyright Zachary D. Lyons. Ooh, baby. Fresh cannellini beans from One Leaf Farm! These lovely little shelling beans are white when dried, but are green when fresh. And when fresh, their flavor and texture are quite different. I love fresh shelling beans in general. They make for great salads, sides, additions to pastas, spreads… but I especially love them in succotash. Just shuck and boil the fresh beans for 15-20 minutes in well-salted water, until just slightly fork tender. Then toss them into a pan with some rendered bacon or some smoked salmon, add corn freshly cut off the cob, some chopped parsley, some green onion, a bit of crushed garlic and some salt and pepper and give it all a good toss until just warmed through. Don’t overcook it. And enjoy! Remember, too, that you can buy, shuck and freeze fresh shelling beans now, and enjoy them all winter. Nectarplums from Collins Family Orchards at Ballard Farmers Market. Copyright Zachary D. Lyons. The last of the season’s funny-named hybrid stone fruit has arrived: nectarplums. Yes, you guessed it. They are a cross betwixt nectarines and plums. They are large, juicy, sweet and delicious, and they’re pretty cool looking, too, eh? Grab some today from Collins Family Orchards. Olsen Farms pork belly bacon (left) and jowl bacon (right) at Ballard Farmers Market. Copyright Zachary D. Lyons. This gorgeous bacon is from Olsen Farms. On the left is traditional pork belly bacon, and on the right is pork jowl bacon. And while both are great, the jowl bacon has its own unique, somewhat sweeter, flavor to it that I love for adding to vegetable dishes and pastas. Gorgeous chard from Alm Hill Gardens at Ballard Farmers Market. Copyright Zachary D. Lyons. As the days are getting shorter and (a little) cooler, now’s a great time to enjoy some fabulous late-summer greens. This stunning chard from Alm Hill Gardens is wonderful simply sautéed with a little garlic until just wilted, or added to grain salads or soup. Jerry Baxter of Got Soup? presiding in his kitchen over some of the many local ingredients he uses. Copyright Zachary D. Lyons. Why is this guy smiling? Truth is, Got Soup‘s Jerry Baxter always seems to be smiling. Maybe it is the amazing soups he makes for us, in an extraordinary variety of flavors. Maybe it is the great, local ingredients he uses to make his soups, like these from Alvarez Organic Farms, Martin Family Orchards, Nash’s Organic Produce, Olsen Farms, and so many other great local farms, seen at his kitchen recently. Maybe it is because he has figured out how to spend his days either making soup or hanging out at farmers markets, and getting paid for it. Whatever the case, his soups will definitely make you smile, too! It is the first Sunday of the month, and that means we enjoy a visit today from Fishing Vessel St. Jude! They have the finest local albacore tuna you will find anywhere. It is available in sashimi-grade frozen loins, dried, smoked, and canned. In fact, the canned tuna is great to send home with your visiting relatives! Just make sure they understand not to drain off the liquid inside the can. That is the tuna’s natural juices, not added water, and as such, it is full of flavor! J.H. Hale peaches from Martin Family Orchards at Ballard Farmers Market. Copyright Zachary D. Lyons. J.H. Hale peaches from Martin Family Orchards are big, beautiful, sweet and juicy. They are the quintessential peach — the peach’s peach. They are the legendary peach for which Washington is famous. When you look up “peach” in the dictionary, you’ll see these guys. They are a freestone peach, making them easy for canning or making cobblers. And they are in season now! Kale-spinach tortelloni from Pasteria Lucchese at Ballard Farmers Market. Photo courtesy Pasteria Lucchese. It is fine pasta weather again, since you can count on your house cooling off overnight, in spite of daytime still being warm. These kale-spinach tortelloni from Pasteria Lucchese will certainly hit the spot for a lovely blast of flavor and quick prep time on a busy weekday evening. Sunday, August 10th: Happy Farmers Market Week! Happy National Farmers Market Week! 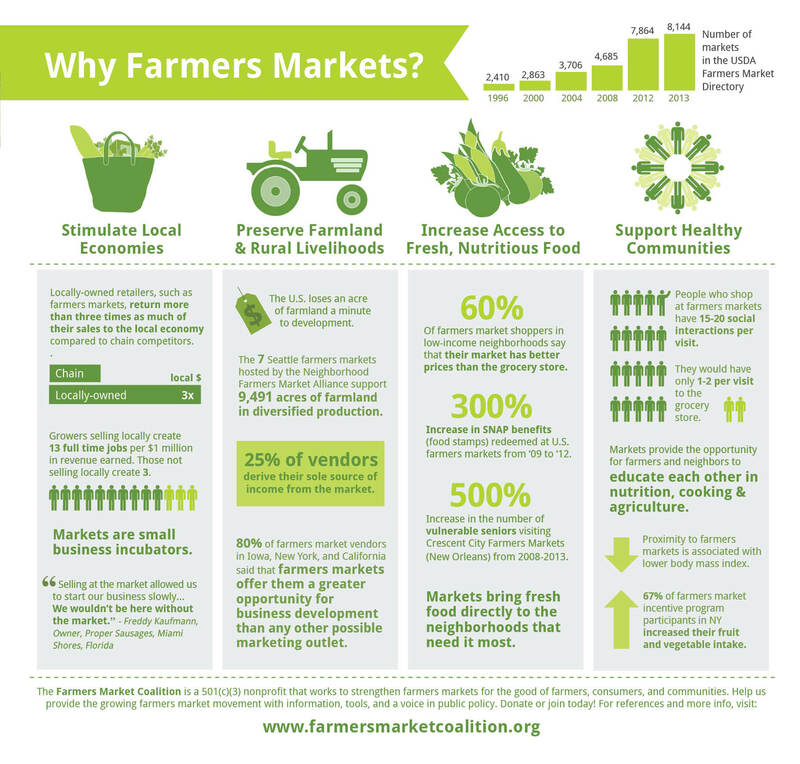 Check out this list of all the amazing benefits markets like your Ballard Farmers Market provide to your community. (You can download this image just by clicking on it.) And guess what else? Your Ballard Farmers Market just won Seattle Weekly’s Readers’ Choice Best Farmers Market Award for at least the fifth year in a row! (Honestly, we’ve lost count. And thank you!) Oh, hey, we’ll have great recipe cards for Farmers Market Week from Washington State Farmers Market Association today at the Market Information Desk, too. Copia (top) and Brandywine tomatoes from One Leaf Farm. Photo copyright 2014 by Zachary D. Lyons. One Leaf Farm is rocking the Brandywine and Copia tomatoes right now! The Brandywines (bottom) may not be the most flamboyant of tomatoes, but they are one of the most delicious — the perfect vehicle for salt and mayo, or on a BLT, or in a simple caprese salad. Copias, on the other hand, are quite flamboyant. Just look at all their different colors and stripes and shapes and sizes! Plus, they are awesome to eat, and they will add a ton of character to whatever creation they join! Pan-roasted padron peppers from Alvarez Organic Farms by Chef Derek Ronspies of Le Petit Cochon. Photo copyright 2014 by Zachary D. Lyons. Padron peppers from Alvarez Organic Farms as pan-roasted by Chef Derek Ronspies of Le Petit Cochon last week during his cooking demonstration at our sister Wallingford Farmers Market. Consider this as enticement to visit today, AND as a recipe. Get your skillet nice and hot, with a high-heat oil, toss in the padrons and pan-roast until tender and a bit browned. Finish with a good sea salt. Eat. You’re welcome! Rubels blueberries from Whitehorse Meadows Organic Blueberry Farm. Photo copyright 2014 by Zachary D. Lyons. These are Rubels blueberries from Whitehorse Meadows Farm. They are a domesticated wild huckleberry from the East Coast. The berries are small and full of flavor, and they remind me of the wild blueberries we used to pick while hiking up Cadillac Mountain in Maine’s Acadia National Park. I remember I used to eat my weight in them. A saffron crocus in full bloom at Phocas Farms. Photo courtesy Phocas Farms. Our pal Jimmy, from Phocas Farms, tells us that he’s still got some saffron crocus corms available today for you to plant to grow your own saffron, and that if you get them today, you still have time to get them in the ground so that you can harvest them this fall! Yep, these beauties bloom in the fall. See those gorgeous red threads in the flower above? That’s the saffron. So grab some today, and start your own little saffron plantation! Oh, and he’s got a little bit of last year’s saffron harvest left, too! Lodi apples from ACMA Mission Orchards. Photo copyright 2013 by Zachary D. Lyons. Guess what? It is already apple season! The first apples of the year are now arriving at your Ballard Farmers Market. They tend to be tart, green-skinned varieties, like Ginger Gold, Gravenstein, Shamrock, and these organic Lodi apples from ACMA Mission Orchards. Carrots from Nash’s Organic Produce. Photo copyright 2014 by Zachary D. Lyons. Nash’s Organic Produce is going carrot crazy this week! Besides these sweet and crunchy bunch carrots, they’ve got plenty of their five-pound bags of Nash’s Best Carrots, as well as big bags of juicing carrots. So get down with your bad, carrot-loving self today at your Ballard Farmers Market! Cherry plums from Tiny’s Organic. Photo copyright 2014 by Zachary D. Lyons. From the pages of the confused fruit handbook come these cherry plums from Tiny’s Organic Farm. But unlike so many other stone fruits that have been hybridized to create things like apriums, pluots, nectarcots, peachcots and more, cherry plums are actually a true plum, not a cross betwixt cherry and plum. They get their name from their small, cherry-like size and their color. But they have the flavor and texture of a plum. So mix it up this week and try yourself something new… or actually old, in this case. Baby cabbages from Stoney Plains Organic Farm. Photo copyright 2014 by Zachary D. Lyons. And under the heading of learning something new every day comes these little, baseball-sized baby cabbages from Stoney Plains Organic Farm. You see, after they harvest the full-sized cabbages in the field, they leave the cabbage plant there, and it grows a second, smaller head of cabbage… this cabbage. Who knew? So, if you need just enough cabbage for one serving of cole slaw, or perhaps you want to braise or grill little, individual servings of cabbage, this is for you! Rosa-Hale peaches from Martin Family Orchards. Photo copyright 2014 by Zachary D. Lyons. Free-stone peaches have arrived. There is a family of peaches, all with the word “Hale” in their names, and these are the big, yellow, sweet and juicy peaches for which Washington is famous. They come freely off of their pits, ergo the term “free-stone,” and that makes them ideal for cooking and canning, as well as just eating fresh. Think of the pies, cobblers, preserves, salads, and more! These particular peaches are Rosa-Hale peaches from Martin Family Orchards. Soft-ripened Tallulah cheese from Glendale Shepherd. Photo courtesy Glendale Shepherd. If you love stank cheese like I love stank cheese, then this cheese is for you! Meet Tallulah, a soft-ripened sheep’s milk cheese from Glendale Shepherd. This is the kind of character-rich cheese that would make a Frenchman weep. If you prefer to wrestle with your cheese instead of waltzing with it, you gotta get you some Tallulah today at your Ballard Farmers Market! Oh, and this just in: Glendale Shepherd as also begun packaging a five-cheese shredded blend of their sheep cheeses for easy sprinkling on pastas, salads, grilled sandwiches, roasted veggies and more. Collard greens from Oxbow Farm. Photo copyright 2013 by Zachary D. Lyons. I loves me some Oxbow Farm collard greens! Sautéed until just tender with some lovely bacon from Olsen Farms, Skagit River Ranch or Sea Breeze Farm, and some heirloom garlic from Jarvis Family Garlic Farm, how can you go wrong? It is delicious and nutrient dense, and it makes a great side for so many proteins, or just build dinner around the collards themselves! Canned salmon from Loki Fish. Photo copyright 2011 by Zachary D. Lyons. Pain au Chocolat from Snohomish Bakery. Photo copyright 2014 by Zachary D. Lyons. There is just something about a chocolate croissant, you know? Flaky, buttery pastry wrapped around deep, dark chocolate… meow! I heart them! And Snohomish Bakery makes some lovely ones that they offer to you right here at your Ballard Farmers Market. Grab one to snack on at the Market, and a few more for tonight’s dessert! Posted in Alerts, What's New?, What's Next? | Comments Off on Sunday, August 10th: Happy Farmers Market Week! Sunday, July 27th: Alien Stone Fruit, Ginormous Fish, Spectacular Leaves, Onions You Can Eat Like Apples, Snow Peas Of A Different Color & Something For The Cave Man In All Of Us! Donut peaches from Collins Family Orchards. Photo copyright 2014 by Zachary D. Lyons. These other-worldly looking donut peaches from Collins Family Orchards are one of my favorite stone fruits. And considering that there are literally hundreds of different stone fruits — indeed, dozens of different peaches — that’s saying something! They get their unusual shape from their tiny stone, and because this is a free-stone variety, its flesh separates from the stone very easily, making it an easy eater, and an easy peach to cook with. Donut peaches are sweet and juicy, yet tend to be small enough that they are easy to eat. And while they will dribble on your shirt with the best of peaches, they are perhaps the least sloppy of peaches. Try one today! Huge king salmon from Wilson Fish. Photo copyright 2014 by Zachary D. Lyons. The boys at Wilson Fish have been having a tremendous season catching fish off the Washington coast. These are whole king salmon, weighing in at more than 25 pounds each! That’s some big king salmon, but it is by no means the biggest one they’ve caught. The result is big, beautiful fillets and whole fish that will feed a small army. Do not miss out on this season of wild Washington salmon! Rainbow chard from One Leaf Farm. Photo copyright 2014 by Zachary D. Lyons. Talk about stunning colors, I cannot recall a year in which chard has been so colorful. Indeed, in a year in which most crops are thriving, chard stands out. The harvests of chard throughout Western Washington in 2014 have been nothing short of epic, which big, beautiful, delicious leaves that will just plain make you smile. These particular marvels of nature come from our friends at One Leaf Farm. Sweet onions from Alvarez Organic Farms. Photo copyright 2014 by Zachary D. Lyons. These sweet onions from Alvarez Organic Farms are the stuff of legend. They are from Walla Walla sweet onion seed, but we call them “sweet onions,” without adding “Walla Walla” in front, because the name, “Walla Walla sweet onion,” is protected by a federal USDA Marketing Order, only to be used for onions grown within a 50-mile radius around Walla Walla. Never the less, Alvarez grows them just outside that range, in much the same hot, dry conditions that result in an onion you can eat like an apple! They’re that sweet. Heirloom snow pears from Alm Hill Gardens. Photo copyright 2014 by Zachary D. Lyons. These beautiful snow peas are from Alm Hill Gardens. The yellow ones are an heirloom variety with its roots in India, whereas the purple ones are a relatively new variety, bred over the last three decades. See, purple is a new color for snow peas entirely. Both are sweet and crunchy, and excellent quickly sauteed as a side dish. Beef rib chop from Sea Breeze Farm. Photo copyright 2011 by Zachary D. Lyons. To be honest, I haven’t the foggiest idea if Sea Breeze Farm will have any of these Flintstone-esque beef rib chops today, but that’s neither here nor there. That’s because pretty much anything they’ve got in the case today — and their case does vary, a la “it’s a farmers market, folks,” every week — is going to be really tasty, and from happy animals raised by people you know, because those people are the ones standing directly behind the case. Heck, I had some beef tongue and some duck breast from them this past week that were almost transcendental. So grab a chop, a roast, a bird, some charcuterie or a few links, and reconnect with your inner Fred. In case you haven’t noticed, Propolis Brewing, from Port Townsend, is all about the seasonal ales. That means that their ales change every month or two to feature the flavors of the season. And today is new release day! Yes, Propolis has informed us that they’ll be releasing their first Washington State award-winning Ale, “Litha,” a Chamomile Saison, as well as a new Spruce Saison & Birch Ale today at your Ballard Farmers Market! Woohoo! Sweetheart cherries from Lyall Farms. Photo copyright 2014 by Zachary D. Lyons. When Lyall Farms starts bringing in the sweetheart cherries, we know that cherry season is beginning to wind down, because they are the latest cherry variety. So if you haven’t taken the opportunity to enjoy the outstanding cherries that 2014 has produced, do so now, while you still have the chance! Hericot vert green beans from Stoney Plains Organic Farm. Photo copyright 2013 by Zachary D. Lyons. Hericot vert green beans are not only redundantly named, they are the most delicate of green beans — thin and tender — and they just beg to be sautéed with some good bacon and some pearl onions. Stoney Plains Organic Farm has lots of them today, along with at least four other varieties of green beans. Yeah, baby! Tomatoes from Colinwood Farm. Photo copyright 2014 by Zachary D. Lyons. Colinwood Farm is cranking out lots of tomatoliciousness right now. Just look at this veritable potpourri of tomatoes in this basket. Big ones. Little ones. Sweet ones. Orange ones. Round ones and wrinkly ones. 2014 is shaping up to be a barnburner when it comes to maters. Don’t waste your time with those tasteless things at the Big Box store when you can get some of these freshly harvested, vine-ripened beauties. Detroit beets from Nash’s Organic Farm. Photo copyright 2014 by Zachary D. Lyons. This gorgeous shot of Detroit red beets sporting spectacular beet greens from Nash’s Organic Produce serve as a reminder to us all that when you buy a bunch of these sweet, earthy roots, you are actually getting two dishes for the price of one! Roast, grill, steam, pickle or shred the roots, and then use the greens as you would chard. Don’t go wasting perfectly delicious food by tossing those greens! Chicken (top) and duck eggs from Stokesberry Sustainable Farm. Photo copyright 2013 by Zachary D. Lyons. Our farmers are producing more eggs than ever it seems, which means that your chances of getting some at your Ballard Farmers Market are better than ever. Just check out these certified organic chicken and duck eggs from Stokesberry Sustainable Farm, for instance. Laid by happy birds that get to run around and get plenty of fresh air, they are way better than anything you’ll find in a Big Box store. In fact. those duck eggs are the only eggs Seahawks quarterback Russell Wilson will eat! Yes, Stokesberry supplies both the Seahawks and the Sounders with poultry and eggs. And hey, both teams are at the top of their leagues. What can these eggs do for you? Well, if you want to find out, don’t come tooling into the Market at 2:45 p.m. looking for them. I said our farmers have more eggs. I didn’t say they have an endless supply of them! Victor Jensen in the aging room at Golden Glen Creamery. Photo copyright by Mandy Alderink, courtesy of Golden Glen Creamery. The Jensens of Golden Glen Creamery have been making gouda and cheddar cheeses up on their dairy farm in Bow for generations. See, when all the Dutch settlers came to the Skagit Valley to grow tulips, someone had to make cheese for them, right? Enjoy a taste of Washington’s history with some their fine cheeses today! Chesnok Red garlic from Jarvis Family Garlic Farm. Photo copyright 2014 by Zachary D. Lyons. It is time to get your garlic on, folks. Whether you be sautéing some greens, cooking a roast, making pickles, or whatever you might need it for, Jarvis Family Garlic Farm has the right variety of garlic for you, from mild to wild. They grow it over in Clallam County, on the North Olympic Peninsula, where the rain shadow of the Olympic Mountains means their soil is not so wet as most other parts of Western Washington. That makes for great growing conditions for garlic, and we are the beneficiaries! Kalamata olive bread from Snohomish Bakery. Photo copyright 2014 by Zachary D. Lyons. Moist, chewy, with little explosions of salty oliveliciousness throughout, you will adore this kalamata olive bread from Snohomish Bakery. It is just one of a dozen or so varieties of artisan breads they bake. Stop by for some to compliment your Sunday night supper today! Tamarind-Ginger, Lemon-Lavender and Blueberry-Basil fresh sodas from Soda Jerk Soda. Photo copyright 2014 by Zachary D. Lyons. Finally, how about some fresh sodas from Soda Jerk Soda. Check out their current selection of flavors, including Tamarind-Ginger, Lemon-Lavender and the oh, so localicious Blueberry-Basil. And remember, their cups and their straws are compostable. When you go to dispose of them, please take a moment to recognize our green composting and blue recycling waste receptacles throughout your Ballard Farmers Market, and please make an effort to put your cup in the correct receptacle. Each receptacle has what’s okay to put in it pictured right on the lid. Please do not put the wrong materials in, because that drives up the cost of recycling and composting, and it can result in the entire container being sent instead to a landfill. It’s easy. You already do it at home every day. Your understanding and cooperation are appreciated.